Summary: This second-person account of life aboard the Alvin (“You stand and seal the sphere, silencing the world outside.”) tells what it’s like to travel two miles beneath the ocean. The three scientists on board spend their day exploring life in the darkest depths of the sea and collecting specimens to study back in the lab. At 8:00 a.m., they seal themselves into the small craft, then sink down, not returning until 5:00 p.m. There are dangers, such as getting trapped in a fishing net or anchor chain, and nuisances, like not having a bathroom on board. But there’s also the reward of studying uncharted territory and making new discoveries about life deep undersea. Includes additional information about the Alvin, a description of the animals that appear in the book, a glossary, and a list of additional resources. 32 pages; grades K-4. Pros: A straightforward, you-are-there account of a day in the life of a scientist. Kids are sure to be intrigued with the idea of traveling so far down in the ocean. 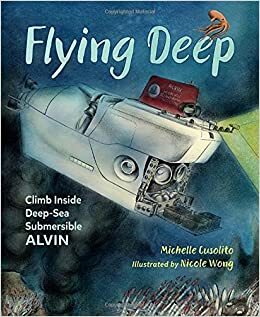 The illustrations do a nice job of capturing the look of the undersea world at different levels as the Alvin travels up and down. Cons: My claustrophobia kicked in around page 6. Thanks for reviewing this book — Michelle is my publishing house sister and I LOVE her energy, her enthusiasm for great learning and fun through KidLit and this book! She would be great at an author visit!